Guildie and I are standing in Onyxia's Lair summoning pets and using the magical biscuits, and it got us thinking - what's the biggest pet? Just came up as I always have my Son of Animus out, 200% size, while I'm under the Gnomeregan Pride trinket effect. We're going for the Guild Herald/Squire, but Sinister Squashling was the tallest combat pet we could find (the stalk takes it above Anubisath Idol). I think it's the Etheral Soul-Trader, as with no buffs at all he is already almost as tall as my Troll toon. I'll have to try and hit him with one of the biscuits to see how big he can get. EST is definitely the "tallest" pet I can think of being in the middle of sizes for player races but I'm not sure that makes him the biggest. There could be a pet that is a little "shorter" but much bigger because it was an elephant or some other similar model. The Horde herald and page (orc) are pretty tall. Taller than EST, I'm pretty sure, and the banner on the back makes them even bigger. Not sure if the alliance versions are taller or shorter. Stunted Shardhorn and Clefthoof Runt are pretty large, but not particularly tall. I think the EST is taller than the Herald or page (with out the banner) but I'd have to compare them to be sure. Just checked. My orc hunter, who is exactly the same height as the guild page, is just slightly taller than the EST. Not sure about the alliance herald/page though. If we are talking girth, the Mini Thor is quite voluminous. Especially when adding a biscuit to him. [pet]Giraffe Calf[/pet] is pretty cool with a biscuit. 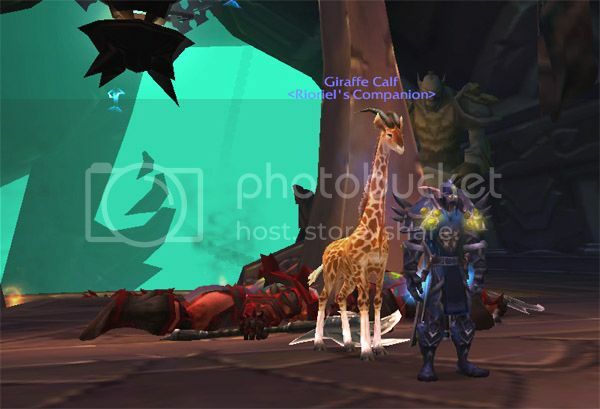 Kring wrote: [pet]Giraffe Calf[/pet] is pretty cool with a biscuit. Ha, that's a great shout. My toon is a Nelf male, for reference. [profile]Drrum[/profile] has an amazing gallery of MANY pets (not all) under the effects of a pet biscuit. It's a great place to start looking at all the varying pet sizes IMO. For me, the problem with determining which pet is the "biggest" is that "biggest" is too broad a description. Big as in height? Big as in length? Big compared to a player's toon or in general? What about flying/hovering pets? Does the height at which they float above the ground count? I think "biggest" needs to be broken down even further into more specific categories for better comparison. Or maybe I'm just over thinking this. Quintessence wrote: [profile]Drrum[/profile] has an amazing gallery of MANY pets (not all) under the effects of a pet biscuit. It's a great place to start looking at all the varying pet sizes IMO. Wow she has got WAAAAY too much time on her hands. The biggest one I have seen is the Minfernal.